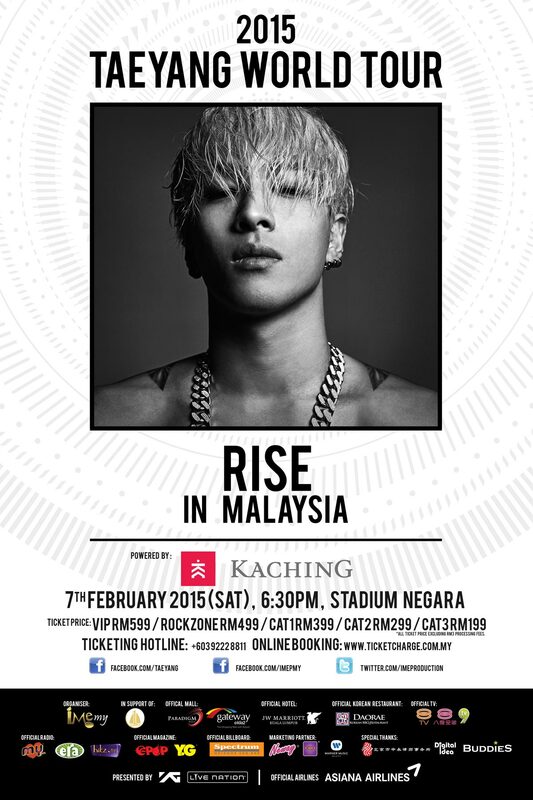 Taeyang, member of popular K-Pop group BIGBANG, will hold his first ever world tour in Malaysia on 7 February 2015 (Saturday), 630PM at Stadium Negara (Kuala Lumpur). This concert is organized by IME Productions. IME Productions shared that they spent RM1.5 Million on production fees so as to replicate Seoul concert’s high specification production and stage effects for all the fans in Malaysia. The stage walkway is divided into various areas, so VIPs can definitely expect up-close and personal interactions with Taeyang during his performances. To thank the fans who had bought the concert tickets, 500 lucky VIP and Rock zone ticket holders will be selected to watch Taeyang Sound Check Party while 10 lucky VIP ticket holders will stand a chance to get up-close with Taeyang at the ‘Meet & Greet’ and Photography session. Lucky winners will be drawn by the organizer based on tickets’ barcode number. Taeyang’s 2nd solo album “RISE”, that was unveiled this year, swept the music charts all across the world. His title track “Eyes, Nose, Lips” was also ranked #1 on Korea Gaon’s Karaoke Chart for 9 weeks in a row, which is the longest for any artiste. At the most recent MNET Asia Music Awards 2014, Taeyang won The Best Vocal Performance Male, Best Male Artist and Song Of The Year. A feat that is by no means easy. A special ticket launch will be held on 7 December 2014 (Sunday) at Boulevard, Level G, Paradigm Mall from 11AM to 4PM. First 1000 tickets sold at the ticket launch will also come with a limited edition giant poster. So if you want your hands on it, do head over to Paradigm Mall. Online sales will begin on 7 December 2014 (Sunday) at 4PM via TicketCharge website (www.ticketcharge.com.my). TicketCharge ticket hotlines will begin on 8 December 2014 (Monday) at 10AM, please call (603) 92228811 should you want to purchase your ticket. Outlet sales will begin on 8 December 2014 (Monday). Please visit TicketCharge office, Speedy music store, Rock Corner music store, Victoria music center, Neway Karaoke outlet and Celcom Blue Cube outlet. 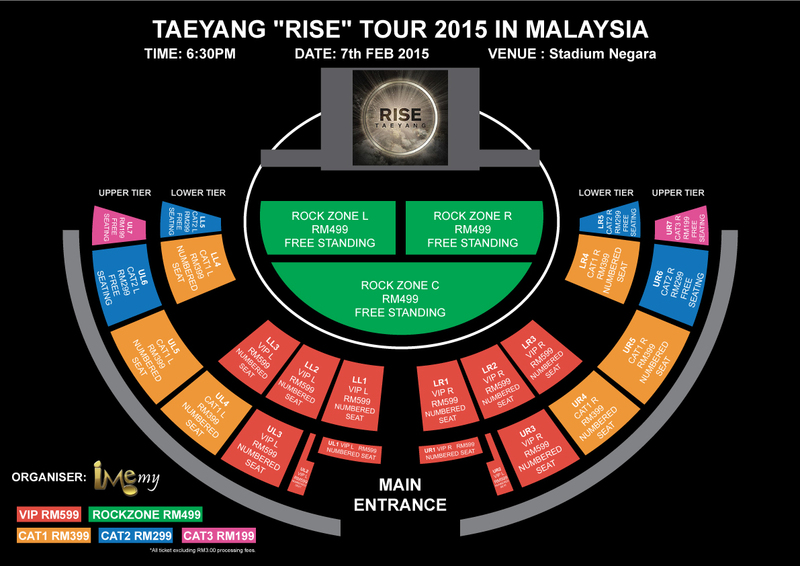 Taeyang will release a [RISE] World Tour Edition album specially for Malaysia VIPs! The first 500 ticket purchasers (regardless of during ticket launch or online) are entitled to purchase the [RISE] World Tour Edition album at RM50 per CD. This special edition includes three bonus tracks and is not sold at any music store. For more information, please refer to IME Productions’ Facebook (www.facebook.com/imepmy). B.A.P LIVE ON EARTH 2016 WORLD TOUR SINGAPORE AWAKE! !